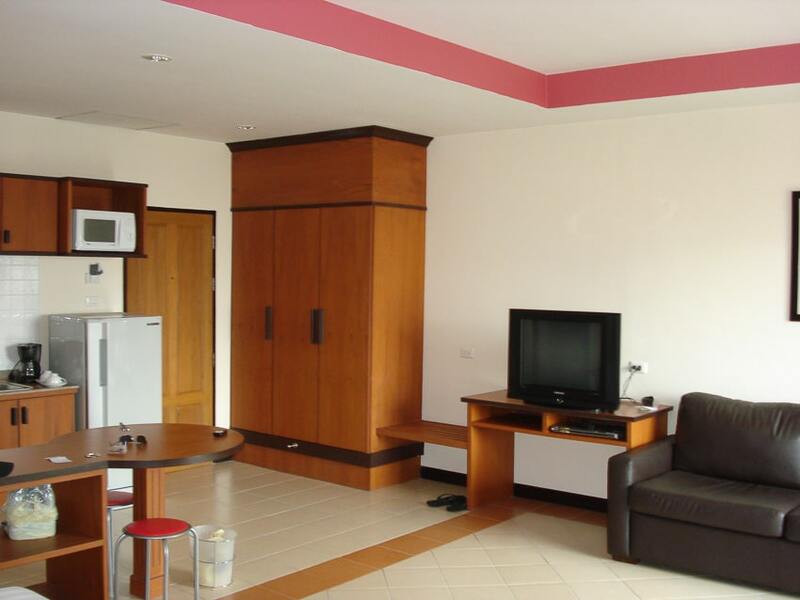 The Pattaya Bay Resort are serviced apartments as opposed to a standard hotel. They have kitchenettes and offer long term stay rates if you would like to book for a month or more. 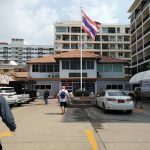 It is situated in a great spot, on a small quiet Soi a quick walk from the Pattaya Avenue Mall, which you can cut through to get to Second Road. It’s a reliable hotel that has been around for years and is know for it’s good customer service. If not for the need for a renovation and the intrusive OZO hotel next door, it would still get top marks. A major renovation is scheduled for the second half of 2016 and it should reopen by 2017. This is great news. 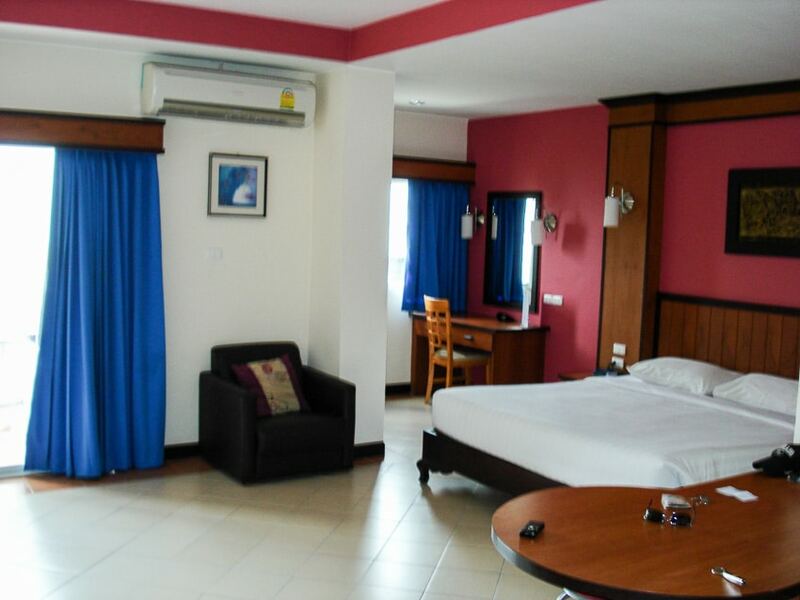 The Deluxe room at the Pattaya Bay Resort has a large king sized bed, writing or computer desk, a lounge chair, and a small balcony. You’ll also found a couch that isn’t positioned in the best way, i.e. facing the bed not the TV. It has a large cabinet to store your clothes, which also contains the in room safe. The room comes with a kitchenette. It has a full size fridge, sink, microwave and coffee maker. 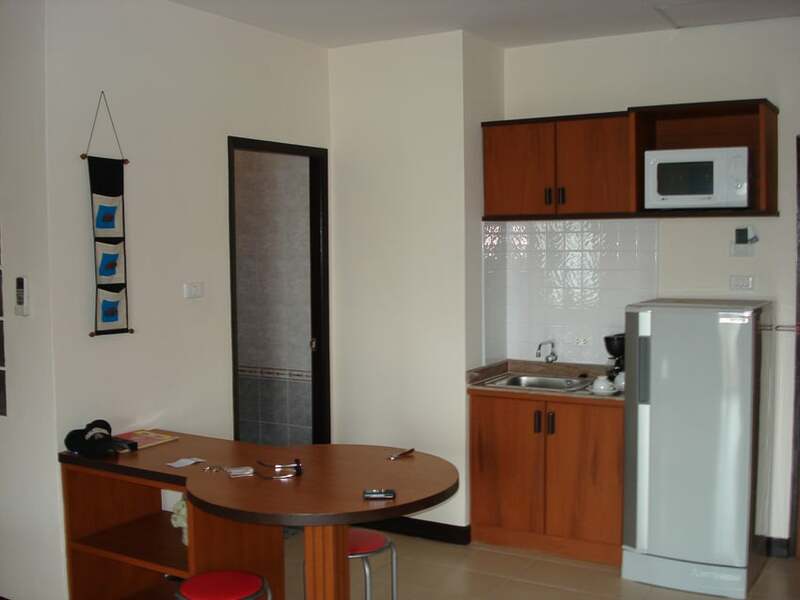 There is also a small seating area if you want to make yourself a meal in the kitchenette. All things you would expect in a serviced apartment. 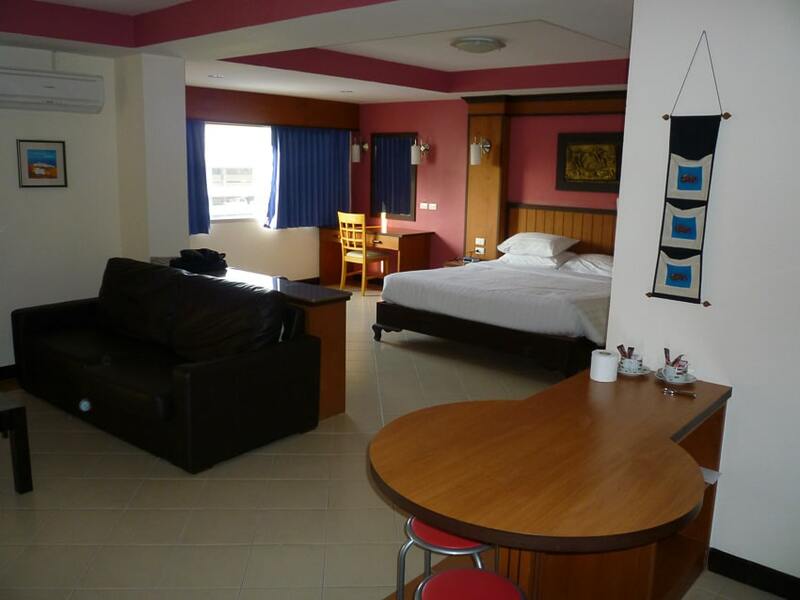 The rooms at the Pattaya Bay Resort are quite large and have everything you need. They decor may not be to everyone’s taste (Redish-Pink walls? Fortunately just for accent) but it isn’t off putting. The beds have seen better days, but that should be handled in the refurb. 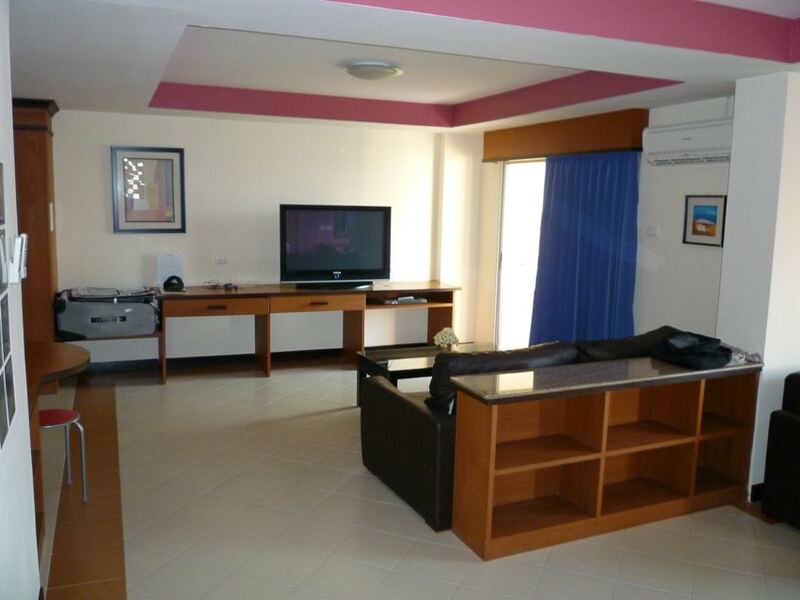 TV’s are the older types, with flat panel screens in only some of the rooms. If you want to spend some extra cash try out the mini-suite at the hotel. It has a living area with a couch and big flat screen TV, as is very spacious. I got the chance to stay in it for a week a few years ago and it was excellent. You can get a better look here of the living room and the nice large television. Plenty of storage space in those cubby holes for your clothes. And white walls. Though it doesn’t look like it in the pic the bathroom is quite large. There are two sinks and a big walk-in shower able to accommodate two or more. 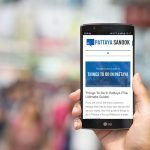 >>For more hotel options check out the Guide To Guest Friendly Hotels in Pattaya. The service at this hotel has always been great. They really try and look after the customer and help you out as needed. If you comeback they remember you from your previous stay, even if it’s been a year since your last visit. 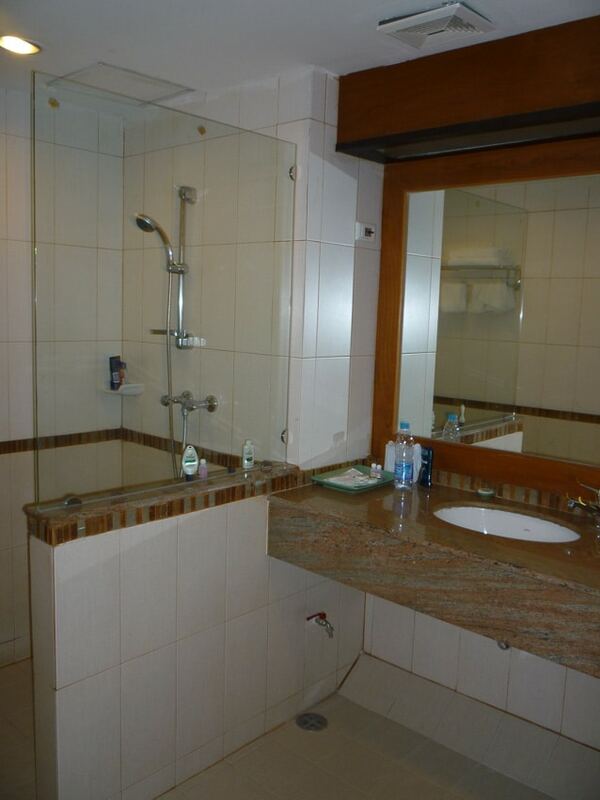 The rooms are cleaned daily with fresh towels provided. They also offer laundry service like most hotels. You fill out a form with your items, put them in a bag and the housekeeper picks them up. If they are received early enough in the day you may even get them back the next afternoon. The hotel offers a free shuttle to drop-off or pickup guests at Second Road or Soi 15 and Soi Buakhao. You can call the hotel from you cell and make arrangements for the tuk-tuk to come and pick you up. While a lot of the facilities are a bit out of date, it does have a pool and a small workout room. The fitness room doesn’t have a lot of equipment, and what it does have is old, but if you are in need of a workout while on vacation it can certainly get the job done. As mentioned earlier in the review, the location is one of the big benefits to staying at the hotel. You are right in the center of town and close to anything, either by walking or by a baht bus or moto-taxi ride. The Avenue Mall has Starbucks, restaurants, a grocery store (Villa Market), and even a bowling alley and movie theater. 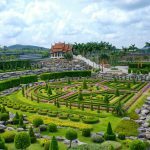 You can easily walk to Second Road or Soi Buakhao (or take the shuttle), from there you can get to anywhere by public transport. Once you get to Second Rd., it is a quick walk to the beach.